Why is Maintaining SEO Important? 00:02 Noel Lopez: So, SEO. What is it? Is it important? How does it impact me? How does it work? We've gotten that type of question from clients in a variety of different ways, and really, the biggest most important aspect of SEO is it's gonna impact your bottom line. By implementing the right SEO strategy you'll see results, and it's really gonna go a long way for your eCommerce business. 00:25 Chris Ching: Yeah. So, jumping off that they also ask, how does it impact my bottom line? Well, it could be essentially your, essentially, your biggest inbound marketing channel for selling your products and getting those conversions. And, how you do that is basically, effective keyword strategy, backing strategy, and making sure you have a very well maintained site. You know, page load is very important, making sure that people can access your content within just a few seconds. 00:48 Chris Ching: But, what I really wanna hit home on is the maintenance. Why do clients need to have maintenance on a month to month basis? 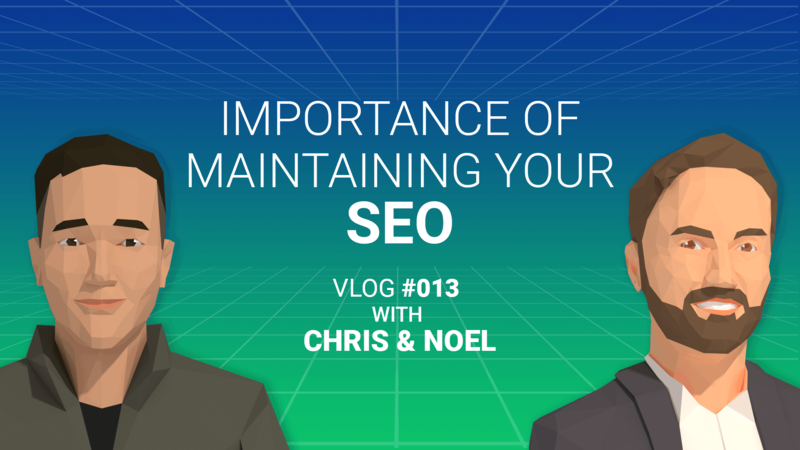 00:55 Noel Lopez: So, SEO, even though you can establish a great foundation and have a great strategy, if you don't maintain it, you don't upkeep it, you're gonna get lost. Think of SEO as really a race or even popularity contest. If you don't keep putting yourself out there, showing yourself as an industry leader, you're just gonna get forgotten, lost in the shuffle, and honestly, you don't want that to happen. 01:18 Chris Ching: Yeah. Then you've got to also think about all your competitors. What are they doing? They're probably trying to climb up the rankings as well, brand those keywords. So, you might be number one, one day for a certain phrase, and then the next day you could be number three. But, it's also how many keywords can we brand for? Right? We wanna get thousands and thousands or keywords that we're getting ourselves in the page one for search. And, you might be able to complement that with page search as well. Another great tactic you can do is look at the search queries in your page search report. 01:48 Chris Ching: So, you can see how they're actually searching for you, and then tie that into your SEO strategy. 01:52 Noel Lopez: Definitely. And, the other thing to think of is just like your business isn't stagnant, neither is SEO. There's your business might be seasonal. Or, you might even be releasing a new product, in which case you're gonna wanna change and adjust your strategy in order to correctly pivot and make sure that you're not losing out on that portion of your business. 02:11 Chris Ching: Yep. Then you're also gonna wanna watch out for back links. So, back links are essentially a connection from one website to your website. And, that, you know, essentially all connections are not created equal. So, if you get a back link from forbes.com, that's gonna go a lot further than Bob's Burgers. No disrespect to Bob's Burgers, but Forbes gets millions and millions of visitors a year, or month actually. So, that's a huge back link to you, and you wanna keep an eye on that and make sure you're not getting any bad toxic links which you wanna disavow. 02:39 Chris Ching: So, if it's something from Russia, and they're spamming you with a bunch of links, that could actually negatively impact your ranking. 02:46 Noel Lopez: Yeah. So, really a lot goes into SEO, from keywords to back links to your site health, to page speed. All of these factors add up to where you're placed organically and how you rank. So, the biggest thing you wanna do is maintain that, establish it, maintain it, and keep driving those sales through organic leads. If you do have any comments or questions though, definitely feel free to drop them in. We're more than happy to answer. We know there's a lot going on, and we're definitely here to help guide you through it all.